The biggest macro-economic event in the past year has been the collapse in crude oil prices. 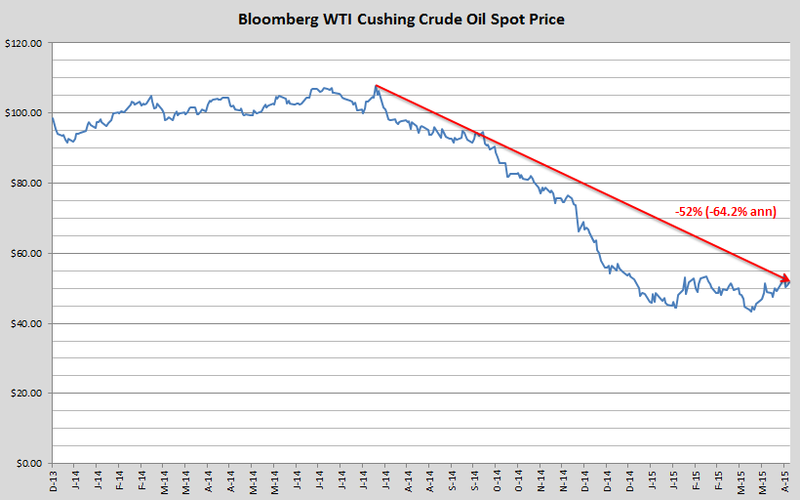 Since mid-July, WTI crude oil spot prices are down over 50%. Crude is the most liquid (no pun intended) and most analyzed commodity on the planet. Its covered exhaustively by a wide array of shareholders and stakeholders; public and private oil producers and consumers, physical traders, banks, and geopolitical think tanks just to name a few. This is why the most interesting aspect about this huge move in crude is that no one foresaw the magnitude or velocity of this decline. Bloomberg had an article back in December on the hedging strategy of some U.S. shale drillers which showed that those companies certainly did not anticipate a decline in crude prices like what we’ve seen. The U.S. as a Small Open Economy?